There are various vacancy openings available in Assam in various sectors. See below and apply for 21 new Govt Jobs in Assam for 12th Pass. These vacancies in Assam are for the only 12th passed and 10th passed students. Here we are your guide to get an indposition in govt sector so that you can live your life with comfortable. Though some private companies give more pay than govt sectors, most people do not like to join a company. There are lots of jobs available in the company offices in Assam and other industries all over Assam for 12th passed students. You can join them to build your career. Otherwise, read the below portion of this article and apply for a govt job of your choice. Are you looking for jobs in Assam? There are 05 govt jobs available in Guwahati now. Get the latest and best jobs for you from the below listings for Fresher Jobs in Assam. Few of the top govt sectors in Assam which are looking for candidates in Assam are ASSAM UNIVERSITY, Gauhati University, Dibrugarh University, IIT Guwahati etc, Gauhai High Court, Indian Army, Indian Navy, N. F. Railways, IAF, SSC, Indian Coast Gaurd. 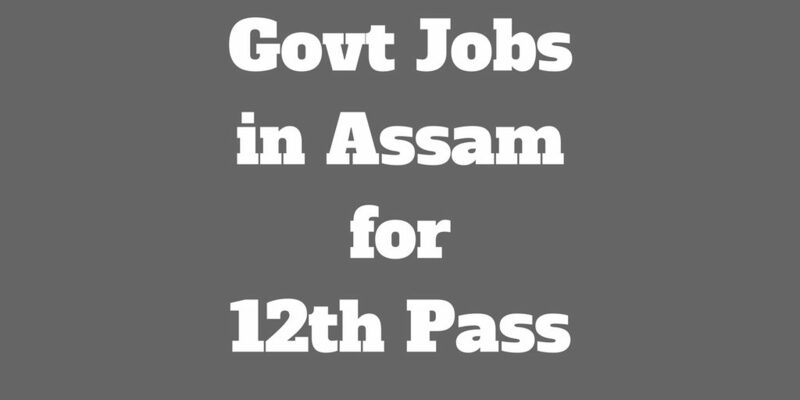 There are certain things that a job seeker should keep in mind while applying for a 12th pass govt jobs in Assam. Job providers’ shortlist candidates if their qualifications match the desired profile. Therefore, based on one’s qualification, one should apply for jobs in the relevant field. After shortlisting the candidates according to their application and eligibility, the will call you for a selection procedure. Most of the time the selection process is a written test and there may be a phisical fitness test. Written test for a candidate of Govt Jobs in Assam for 12th Pass generally consists of Multiple choice objective questions. You will get different options to answer a question. You have to choose only the right one. Every right answer will give you a mark and every wrong answer will give you a negative mark. So, be careful when answering the questions. It is better to avoid a question, for which your answer is not clear. Find the latest govt jobs in Assam here. This is your dream spot to get today's best job for you. Apply now and start practicing from today. This may be your lucky interview to get a government position. These are some of the best Govt Jobs in Assam for 12th pass students. Apply now for a job listed above and get salary.